A Shani Sade Sati Nivaran Upay for the Janma Rashi Kanya or the Moon Sign Virgo has been described by me in this post. This astrological remedy for off-setting and being free from the harmful side-effects of this feared astrological transit of Saturn should be useful for the natives of the Moon Sign Virgo who are affected by this planetary phase. 1] On any Saturday, with you own hands wash, clean or bathe a person who is mentally unstable and having little or no knowledge of worldly-life. After, this put new clothes on the body of that person and feed the person. It is essential to do all these things mentioned with your own hands. 2] Then, go to a lonely and under populated place and place a Tel Ka Diya and 2 Haldi Ki Gathi[2 sticks of turmeric] on the ground and go back to your home. 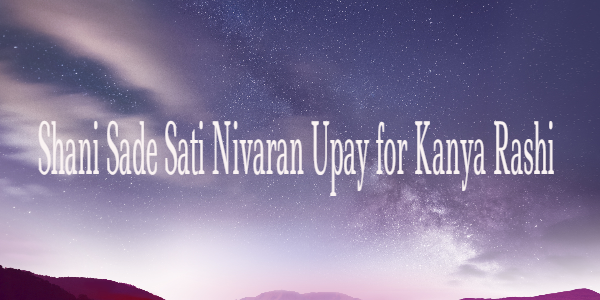 3] Perform this Upay for 5 Saturdays in a row for getting freedom and relief from the trying and turbulent times of the Sade Sati of Shani.